Jared Kirby has been involved in Combat for Screen & Stage and Western Martial Arts for nearly 25 years. He teaches in New York City (and the metro area) and has choreographed fights Off-Broadway, Nationally, in London and Sydney. 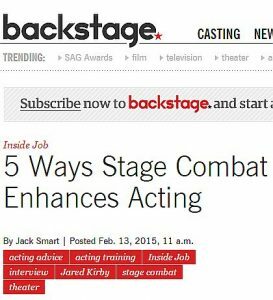 As a Fight Coordinator, Jared has worked with stars such as Peter Sarsgaard, Steve Guttenberg, Cameron Douglas and has trained performers who are working on hit shows. Jared is a member of Actor’s Equity and SAG/AFTRA. He is the president of Combat Con in Las Vegas, past president of Art of Combat, and served for six years on the board of the International Order of the Sword & Pen. 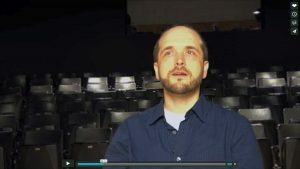 Jared currently teaches fencing at SUNY Purchase, Sarah Lawrence College and is a Master of Arms (Maestro d’Armi) through the Martinez Academy of Arms. 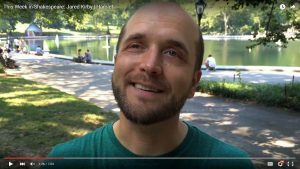 Jared has an ongoing Combat for Screen & Stage class in New York City and teaches at the prestigious Tom Todoroff Conservatory as well as the NY Conservatory for Dramatic Arts. He teaches a variety of workshops across the US and around the world including Canada, England, Scotland, Finland, Italy and Australia. He has taught at the Paddy Crean International Art of the Sword Workshop, the International Swordfighting and Martial Arts Convention (ISMAC), Rapier Camp and the Western Washington WMA Workshop just to name a few. Jared is the editor and one of the translators of “Italian Rapier Combat”, the first complete, professional translation of Capo Ferro. He is also the editor and wrote the introduction for “The School of Fencing” by Domenico Angelo and annotated by Maestro Jeannette Acosta-Martínez. Most recently “The Gentleman’s Guide to Duelling” was released in February 2014 and a reprint of Donald McBane’s The Expert Swordsman’s Companion was released in January 2017. For more information, see Amazon.com. Check out Testimonials to hear what people say about working with Jared. 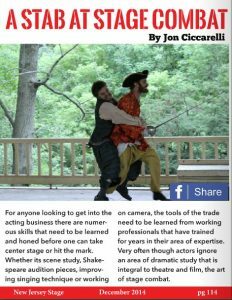 Recommended by Backstage magazine as one of “6 Stage Combat Classes You’ll Want to Check Out.” Read the full article.